"I have nothing to offer but blood, toil, tears and sweat." A newly-published book by Churchill Archives Centre Director Allen Packwood illuminates the agonising decisions faced by the Prime Minister during some of the darkest and most uncertain moments of the Second World War. Winston Churchill looks out from a RAF bomber while visiting Turkey. Credit: Imperial War Museum. At 14.54pm on Monday, May 13, 1940, Winston Churchill stood before the House of Commons and delivered his first address as Prime Minister. In his remarks, which took less than six minutes to deliver, he famously spoke of his policy to wage war &apos;by sea, land and air&apos;, with the single aim of victory, &apos;victory at all costs, victory in spite of all terror, victory, however long and hard the road may be." Churchill normally prepared extremely thoroughly for his speeches according to Allen Packwood, a world authority on Churchill, director of the Churchill Archives Centre at Cambridge University, and author of the new book &apos;How Churchill Waged War&apos;. Yet for this most important of speeches, delivered only three days after taking high office, and critical in setting the tone for his new administration, only a single page survives in Sir Winston&apos;s vast archive at Churchill College, Cambridge. It begins in typescript, but then, after just a handful of lines, degenerates into a hand-written scrawl that itself peters out just before reaching the most famous lines. "What the speech did not contain was any substance or insight on exactly how the new PM would deliver victory," says Packwood. "With hindsight, we know that it was achieved, despite enormous cost, and that with it, Churchill secured his place in history as an iconic figure and famous orator. " In his new book, Packwood, who has worked with Churchill&apos;s archive papers for more than two decades, seeks to understand how he arrived at some of his crucial decisions, highlighting some of the emotion, humanity, uncertainty, complexity and nuance that are often missing whenever Churchill is discussed. "My aim has been to put the spotlight on history in the making," says Packwood. "And to challenge some of the more simplistic assumptions about Churchill&apos;s wartime ministry. "The key moments I&apos;ve chosen in my book are not intended to be comprehensive, but rather chosen because they ask questions that interest me and provide some insight into how Churchill&apos;s approach was shaped and changed by the war." "What sort of war leader did Churchill want to be and why? How did he respond to the bombardment of the Blitz? How did he survive illness and pressure and did he have a strategy for taking the offensive? "These are windows on key moments which provide insight into Churchill&apos;s method of waging war. The figure that emerges is more conflicted, less omniscient - though not always more considerate - and more human, much more interesting than the icon." Churchill addresses the US Congress. Credit: Imperial War Museum. Sign in the Cabinet War Rooms. Credit: Imperial War Museum. Churchill at his seat in the Cabinet Room. Credit: Imperial War Museum. There were no crowds to greet him, when just before 6pm on the evening of Friday, May 10, 1940, Winston Churchill took the short car journey from his offices at Admiralty House along the Mall to Buckingham Palace. The British parliament, press and public were as yet unaware that Neville Chamberlain had resigned as their Prime Minister and that Churchill was about to replace him. Churchill had not chosen to become Prime Minister - though it was a role he was never going to refuse. Nor was he elected to the office. His ascendancy was the result of a unique political and military crisis which left him with no option but to form a national government. Crucially, Churchill also became, with the King&apos;s approval, the country&apos;s first Minster of Defence. This was his first real decision as war leader and it was one that set the tone for his war premiership - Churchill had deliberately placed himself at the heart of the British war machine. He was the engine driving the whole vehicle. This was a pivotal move. The result was a much closer contact between Churchill and his most senior commanders, whom as Minister of Defence, he could and would summon independently. "Once in power, Churchill&apos;s basic character did not change," says Packwood. "His bulldog determination to take the fight to the enemy, his forceful nature and his sheer bloody mindedness feature prominently in the accounts of those working most closely with or for him." Barely two months after becoming Prime Minister, and following hard on the heels of what Churchill called the &apos;colossal military disaster&apos; at Dunkirk, he was faced with an early and deadly test of that resolve and fighting spirit - as the collapse of France led to an enormous change in strategy for the British war effort. In the six weeks from 10 May 1940, German forces defeated Allied forces and conquered France, Belgium Luxembourg and the Netherlands, bringing land operations on the Western Front to an end until June 6 (D-Day) in 1944. As the ability of France and her allies to withstand the relentless German assault became increasingly hopeless, an enormous problem began to present itself to Churchill, his war leaders and the Allied war effort. At the fall of France, it possessed the fourth largest navy in the world, and some of the newest and most powerful battleships ever built. If the French fleet were combined with the German and Italian fleet, Britain would lose control of the Mediterranean, her sea routes to the Empire would be threatened and and her ability to enforce a blockade of Europe and resist invasion would be gravely threatened. The initial hope that the French fleet would fight on under a French administration in North Africa, move to British ports or scuttle itself. Despite making representations on all of the above, on June 22, the French and Germans met to conclude their armistice talk and the British were shut out of all consultations with their former ally. Alarmed, Churchill&apos;s war cabinet met to consider the various locations of the French fleet - with powerful ships moored in Alexandria, Casablanca, Dakar and Oran. Churchill was particularly concerned about the modern battleships Richelieu and Jean Bart, which he felt had the power to &apos;alter the whole course of the war&apos; and stated that &apos;in no circumstances whatsoever should these ships be allowed to escape&apos;. "Rather than that we should have to fight and sink them." Thereafter his view did not waver. The British impounded those French ships in France, hemmed in the force at Alexandria and monitored movements elsewhere. The war cabinet met to discuss the issue three times on June 24 and identified the fleet at Mers-el-Kebir, just outside Oran, with the battlecruisers Dunkerque and Strasbourg, two other capital ships and a large force of destroyers and submarines as the most important units to be eliminated. The decision to act was taken on June 27, with the date for action set as July 3, the earliest date a large British naval force could be within striking distance. The French ships in British waters would be seized, those in foreign waters would be given the option of sailing with the British, sailing to British or overseas ports, putting themselves beyond use, or being sunk. The operation was called Catapult, and the French government were not forewarned so as to preserve the crucial element of surprise. The French destroyer Mogador running aground, after having been hit by a 15-inch shell. Credit: Imperial War Museum. "Churchill watched the events unfold from London, sitting up late into the night with the Chiefs of Staff and the First Sea Lord as reports came in," says Packwood. "Although the escape of some French ships, including Strasbourg, meant that the operation was not a complete military success, one battleship was sunk, two more were damaged, as well as four destroyers being put out of commission." The &apos;success&apos; came with a heavy loss of life, however. As the British guns fell silent, 1,297 French sailors and servcemen has been killed and a further 350 wounded. Churchill, a former First Sea Lord, was visibly affected according to Jock Colville, Churchill&apos;s Assistant Private Secretary and one of his closest confidantes. He overheard the Prime Minister say &apos;This is heartbreaking for me&apos;. Blackburn Skuas, torpedo bombers used to attack the French fleet, take off from HMS Ark Royal. Credit: Imperial War Museum. "How does Churchill emerge from the fall of France and the sinking of the French fleet, his first crisis?" asks Packwood. "There were clearly times when the pressure got to him. There were angry outbursts about the French and their fall to Germany." The only known letter to survive from Clementine Churchill to her husband in 1940 is her famous missive of June 27, 1940, which reveals something of the pressure Churchill found himself under. "I must confess that I have noticed a deterioration in your manner & you are not as kind as you used to be." "Few leaders in modern history can have been faced with such a baptism of fire," says Packwood. "Churchill could not have won the Battle of France, but he could have been led into negotiations with the enemy or succumbed to rash military promises that would have lost the Battle of Britain. "That he avoided these pitfalls is testament not just to his resolve, but also his skills of political management and timing. "But what of victory? In July 1940, it must have seemed a distant prospect. Especially as the bombs started to fall on Britain." Churchill visits a badly bomb damaged street in Valletta, Malta. Credit: Imperial war Museum. It was at the end of the summer of 1940 that the bombs started to fall on the cities. After weeks of attacks on airfields, the German tactics changed. Industrial cities such as Portsmouth, Liverpool, Bristol and Birmingham were first hit. Then the suburbs of London were targeted. It was around 5pm on Saturday, September 7, that the real onslaught against Britain&apos;s capital city began. A total of 348 enemy bombers, protected by 617 Messerschmitt fighters, filled the skies above the East End, dropping 300 tones of high explosives and incendiaries onto the docks below. Stepney, Whitechapel, Poplar and Shoreditch were all set ablaze... followed up by further attacks through the night. This was only the beginning. The bombers would return for the next 56 consecutive nights, and for 75 nights thereafter, excepting only November 2. No modern city had ever suffered such an assault from the air. The war had now arrived on Churchill&apos;s doorstep. The story of the Blitz has become part of the British mythology; Londoners pulling together and many great acts of heroism, sacrifice and generosity. But these were also accompanied by occasional civil disturbances and historians have since described the social response as &apos;complex and fractured&apos; and the national unity as &apos;provisional, conditional and potentially fragile&apos;. Within three days, there were &apos;visible signs of nerves cracking&apos; according to Home Intelligence reports from September 1940. By day four, many were simply voting with their feet. &apos;Families in the Deptford area were making for the hopfields of Kent, taking with them such belongings as they can carry&apos;, while those further west were &apos;making for the mainline stations&apos;, added the report. Nerves were worn down to a fine point with worrying signs of rising class tensions and antisemitism. Churchill remained in Central Westminster and shared the experience of the Londoners. Despite pledging to wage war, the intensity of the enemy attack meant that Britain was now firmly on the defensive. A wide view of the damage sustained by the Peter Robinson department store at Oxford Circus, following an air raid on London. Half of the front of the building has been destroyed and large mounds of rubble are piled outside. Credit: Imperial War Museum. A wide view of the damage sustained by the Peter Robinson department store at Oxford Circus. Credit: Imperial War Museum. Blitz canteen: Rachel Bingham counts out the change for a man buying a cup of tea and a bun from the WVS tea car that she is running with her friend Patience &apos;Boo&apos; Brand. Credit: Imperial War Museum. The remains of Paternoster Square in the City of London after the air raid of 29th December 1940. Credit: Imperial War Museum. "In the autumn of 1940, it could not have been immediately clear what the effect of the bombing offensive was going to be," says Packwood. "Was the bombardment of the capital a sign that the German invasion was about to be launched? "In public, Churchill remained resolute and defiant. Broadcasting to the nation on September 11, with the looming threat of possible invasion, he described the &apos;cruel, wanton, indiscriminate bombing of London&apos; as part of Hitler&apos;s invasion plan and accused Germany of &apos;killing large numbers of women and children&apos; in an attempt to &apos;terrorise and cow the people of this mighty imperial city&apos;." Behind the scenes, he focused on finding a way to take the initiative. Churchill wanted commanders who would be bold, bellicose and take the offensive - men after his own image. He moved quickly to dismiss many of the old guard in the Army, Navy and Air Force. 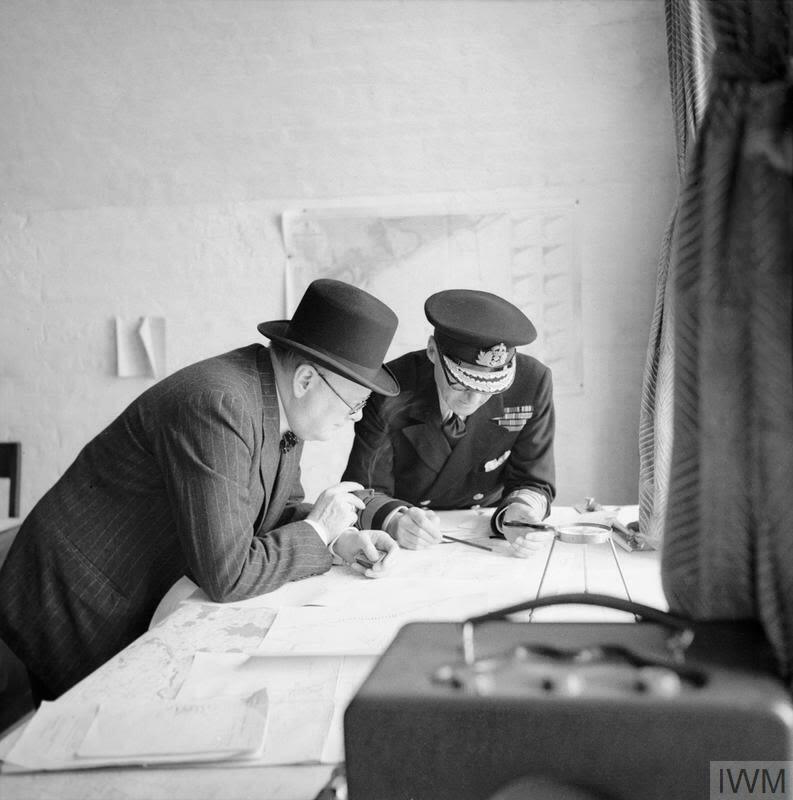 As the bombs continued to fall, and while wrestling with the problems created by the Blitz, Churchill wrote and circulated three directives about future strategy. "The Navy can lose us the war but only the Air Force can win it. Therefore, our supreme effort must be to gain overwhelming mastery in the air. The fighters are our salvation, but the bombers alone provide the means of victory. "We must therefore develop the power to carry an ever-increasing volume of explosives to Germany, so as to pulverise the entire industry and scientific structure on which the war effort depends." 1,000-lb GP bombs fall from the wing-cells of Handley Page Halifax Mark II. Churchill therefore gave priority to the claims of the RAF over those of the Army or Navy. The paper admitted that the main short-term focus would have to be consolidation. The conclusion reached by Churchill was that there were two primary areas in which the country might not have to sit back and take it, and could &apos;give it &apos;em back&apos;: the first was the bombing of Germany, the second, action in the Mediterranean theatre. "Churchill believed in meeting fire with fire, although it is clear that he always expected British bombing to bring further retaliation. But the sheer scale of the Blitz and the related public demands for retaliation contributed to an escalation." The bombing of London and the death and damage seen at first hand, had undoubtedly increased Churchill&apos;s resolution. Bomber Command was also keen to show what it could do. In reality, the policy of bombing Germany was born as much from frustration as revenge with Churchill desperate to find a way of wearing down the enemy and breaking them up. Bomber Command could provide that weapon. Under Churchill&apos;s direction, the War Cabinet approved a somewhat broader interpretation of the current policy of hitting only strategic targets in areas of low population density. As more and more bombs fell on England&apos;s major towns and cities, Churchill decreed "We should also for the time being take as our primary objectives, military targets in built-up areas&apos;. Halifax bomber over Germany. Credit: Imperial War Museum. Then there was the Mediterranean. Britain&apos;s status as a global empire equipped her with the world&apos;s strongest navy at the beginning of the Second World War. Rather than sit back and and strengthen British defences, Churchill chose to reinforce the Mediterranean theatre. By doing so, he was responding to to a real threat to British imperial power and influence, where there were obligations to Egypt, Palestine and Malta, and promises to Greece. To abandon the Empire would have been contrary to everything Churchill held dear. The landing ship infantry Karanja on fire after enemy attack in Bougie Harbour during the North African landings. Troops and ammunition for light guns being brought ashore from a landing craft assault on Arzeau beach, Algeria, North Africa. Credit: Imperial War Museum. Churchill made himself the key advocate for building up forces in the Middle East. He refused to countenance the withdrawal of the British Fleet from the Eastern Mediterranean and in August 1940 enthusiastically backed a plan to send half of Britain&apos;s tanks to Egypt, even urging they should be sent through the Mediterranean rather than the safer Cape route around Africa. Britain had already sent 72,000 men to the Middle East and 53,000 more would arrive by the end of the year. More than half the Army&apos;s best tanks had been sent east. And in spite of the great air battles raging over the skies of Britain, the RAF&apos;s overseas forces were also being reequipped. Churchill giving his famous V for Victory salute during a visit to Bradford. Credit: Imperial War Museum. "This, then, was the plan," adds Packwood. "To take the offensive where possible, by bombing Germany and fighting Italy in the Mediterranean. This is how Britain would begin to wear her enemies down. "In the short term there were some unexpectedly quick gains. Torpedo bombers inflicted great damage on the Italian fleet at harbour in Taranto while Operation Compass, an initially limited assault in the Libyan desert, ended up forcing an Italian retreat of some 500 miles." Italian prisoners resting after a long march are guarded by the crew of a Bren gun carrier in the Western Desert, 16 December 1940. Credit: Imperial War Museum. Yet in war, the goalposts are always moving. The British offensive inevitably brought a strong enemy response and widened the war in the Mediterranean. Hitler sent Rommel and the Afrika Korps to reinforce the Italians in the Western Desert, then invaded Greece through Bulgaria. The British soon found themselves overextended and fighting on two fronts. Refusing his commanders&apos; pleas to reinforce Singapore, Churchill assigned absolute responsibility to the Mediterranean, seeing it as the primary battleground with the Axis powers. "Churchill led from the front in his willingness to take real risks to implement an aggressive policy," says Packwood. "He was prepared to denude Britain of armour, and to transport it by the quicker, but more hazardous, Mediterranean route. Where he differed from those around him was in the intensity of his desire to engage the enemy. "For him it was never just about defence. Victory depended on taking the fight to the enemy on the ground. In 1940-41, the Mediterranean was the only theatre where this was possible." The Prime Minister is seated by a battery of AA guns in the hope of watching them engage a flying bomb. Credit: Imperial War Museum. Winston Churchill fires a Thompson submachine gun alongside the Allied Supreme Commander, General Dwight D Eisenhower, during an inspection of US invasion forces&apos;, March 1944. Credit: Imperial War Museum. Winston Churchill fires a Thompson submachine gun. Credit: Imperial War Museum. Churchill, with his famous &apos;John Bull&apos; hat on his walking stick, waves an acknowledgement of cheers by girls who crowded the window of a Manchester factory. Credit: Imperial War Museum. Churchill waves an acknowledgement of cheers by girls who crowded the window of a Manchester factory. Credit: Imperial War Museum. "The sinking of the French fleet, and Churchill&apos;s willingness to take the fight to the enemy over the skies of Germany, the seas of the Mediterranean and the deserts of Africa are just some of the examples touched upon in How Churchill Waged War," says Packwood. "I could probably have written four or five books with all the crucial decisions he faced. "After 23 years of working on his archive, I wanted to delve into some of the fundamental questions about how he led, not just what he did. That means you end up with a more nuanced story and picture, by stripping away those layers of hindsight. "Other chapters look at Churchill&apos;s approach to both the Soviet Union and the United States, how he survived the fall of Singapore, how his mind and body coped with the build-up to D-Day and why he fought the 1945 election so aggressively." Despite his iconic status now, Packwood&apos;s book reveals that Churchill faced much more opposition than is commonly remembered. He suffered three votes of no confidence, encountered huge rows in Cabinet and faced a barrage of criticism from the press during his wartime ministry. The conclusion Packwood comes to in the book, surprisingly perhaps, is that Winston Churchill&apos;s approach to war was not to have a great, long-term vision and strategy, it was rather a more simple one articulated in the notion of victory at all costs. "He doesn&apos;t have a detailed programme about how to reach that goal," adds Packwood. "His response is very much to focus on one issue at a time, one battle at a time. It&apos;s a very different approach to Stalin and Roosevelt. "They are both thinking beyond the war: FDR wondering what the position is going to be with Russia and Stalin looking to restore Russian power, and provide a sufficient buffer so that Germany can never invade Russia again." According to Packwood, in many ways, Churchill&apos;s approach was much more conservative, looking to preserve the existing order and the Great Britain that he grew up in. He did not want to preside over the liquidation of the British Empire, but rather end up where the country was before the start of the war. He was not convinced by the Beveridge Report and did not sign up to the Utopian vision of the future being offered by others. "That influences a number of decisions he takes - an often overlooked one being Greece. I wanted to know why during Christmas 1944, when his health was failing, when we were still fighting a war on the Western Front, does he drop everything to fly to Athens. "For him, it&apos;s all about preserving Greece&apos;s role as a bulwark against communism. That becomes a massive issue for him in 1944. It&apos;s often glossed over as people concentrate elsewhere, but for me, it underlines his personal bravery and willingness to lead from the front." Joseph Stalin, Franklin D Roosevelt and Winston Churchill at the Tehran conference. Credit: Imperial War Museum. Churchill being cheered by troops, 1944. Credit: Churchill Archives Centre. Churchill inspects bomb damage in Ramsgate, Kent, 1940. Credit: Imperial War Museum. Franklin D Roosevelt and Winston Churchill at the Tehran conference. Credit: Imperial War Museum. "I think one of the most interesting battles Churchill faces is the battle against limited resources," says Packwood. "How do you fight a world war, especially before America enters the war and Russia are able to start driving the Germans back? "If you look at how he juggles different theatres, he prioritises the Middle East for the preservation of the Empire and because he can take the fight to the enemy - he knows his Prime Ministership is going to succeed or fail on the idea of victory. In 1940, France has fallen, Britain is being attacked from the air, and by investing so much in the Middle East, Churchill knows that Singapore and the Far East is left much more vulnerable. "The diaries and letters of Churchill and those around him reveal the wrestling that went on behind the scenes in taking these incredibly complex decisions. At the fall of France, the War Cabinet is in constant session, sitting in smoke-filled rooms, with the pressure and stress mounting every day. "At the start of the war he&apos;s already 65 but robust. As the war goes on, his health deteriorates and in 1944, in the run-up to D-Day, he&apos;s having to be carried out of meetings and up the stairs by groups of Marines. He comes close to death at the end of the Tehran conference and collapses immediately afterwards. You can see his health going downhill badly as you study his war archives." "Do decisions run away with him? Yes, they do, and that&apos;s because of the way Churchill waged war, fixing on one key issue and leaving the running of the Home Front entirely to others. "The effect of waging war at the highest level took its inevitable toll on his health, but he was at his best in the moment, in the heat of a crisis - and at his worst during periods of inactivity and waiting. "Faced with all these challenges, Churchill could not always make the right decision. But in many cases, there were no right decisions, only different outcomes, all potentially difficult and damaging." Churchill sits in a jeep outside the Reichstag during a tour of the ruined city of Berlin, Germany on 16 July 1945. Credit: Imperial War Museum. "If a man is coming across the sea to kill you, you do everything in your power to make sure he dies before he finishes his journey. "That may be difficult and painful, but at least it&apos;s simple. Now, we enter into a world of imponderables, and at every stage occasions for self-questioning arise. "It is a mistake to look too far ahead. Only one link in the chain of destiny can be handled at a time." Winston Churchill looks out from HMS Prince of Wales as USS Augusta sails away following the Atlantic Conference with President Roosevelt. Credit: Imperial War Museum.